Troop 46 was founded in the year 1936. Since it's inception many youth have benefited from learning scout skills, developing leadership skills, and building relationships with other scouts and scouters that last a lifetime. Troop 46 participates in the district camporee annually and was recently awarded the Spirit Stick for best display of scout spirit during the course of the event. Troop 46 has outings every month. These outings include activities like camping, hiking, canoeing, biking, skiing, and more. Each summer we attend a week-long summer camp. Traditionally, we spend every other summer camp at Camp Grimes. 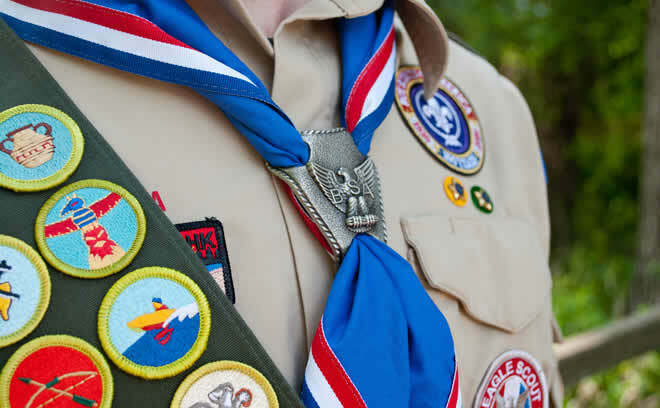 Merit badges are awards earned by youth members of the Boy Scouts of America (BSA), based on activities within an area of study by completing a list of periodically updated requirements. The purpose of the merit badge program is to allow Scouts to examine subjects to determine if they would like to further pursue them as a career or a vocation.